A went a while back to the Inhibitif launch sponsored by Clicks and wanted to test the product out for a good 3 months to see if this product really works for me. When I listened to the talk on the product I really wanted to test it out because what we were being promised was slower body hair growth so basically less work for me in the summer months. When Inhibit was launched in Boots in the UK it became the no 1 product in depilatories and then no 1 online for all skincare products. So what is Inhibitif I hear you all asking? The technology is based on a triple-action approach on the selective inhibitory activity of its formula on the IGF-1 receptor tyrosine-kinase activity. Inhibitif is like a blanket or shield around the hair follicle’s where by the nutrients are prohibited therefore starving the follicle’s. 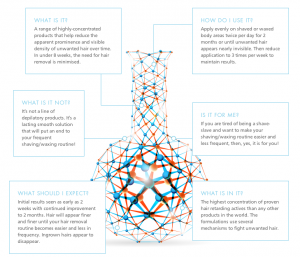 Unlike most products that use one technology to target hair growth, INHIBITIF technology uses 3 proven active ingredients at the highest ever concentrations 0.41% LAUREL ISOQUINOLINUM BROMIDE, 0.20% DIHYDROMYCERIN and 0.25% PSEUDOALTEROMONAS FERMENT. As explained in the diagram you spray 2 times a day for 8 weeks, spray 2 spritzes per leg on each application and apply evenly and hair growth is slowed down and hairs become finer. Its great for all skin types and race but not advised for people with major skin irritation and if you are pregnant speak with your doctor first. You may find it annoying to spray twice a day but just think of it as a necessary part of your beauty routine. So I have been using Inhibitif religiously and I started from having to shave at least twice a week to only once a week which for me with my ridiculous schedule having to shave less is yes thanks for me. I sprayed in the morning after my shower and then again in the evening then you can apply moisturiser after. Even if you not shaving every day you still apply the serum and its for legs, arms, chest and back. Don’t use any where else!!! Its only R300 available at Clicks and for me its a great budget product that really is amazing especially if you suffer from a lot of hair growth. The dedorant is launching this month and the facial serum will be launching soon will keep you posted. Hope you enjoyed my post and start the smooth revolution.